Magento 2 search functionality provided by Elastic Ecommerce is based on the powerful Elasticsearch server which is capable of processing large volumes of data at once. With the engine, your storefront users get the most relevant and extremely fast search results in less than a second. High accuracy of search query results leads to converting website visitors into loyal customers. The intuitive search interface is fully responsive on mobile devices, providing customers with smooth navigation on your store from any device. The autocomplete functionality of the Elasticsearch suite helps your store visitors find the products they might be looking for faster by showing relevant results in the autocomplete window. 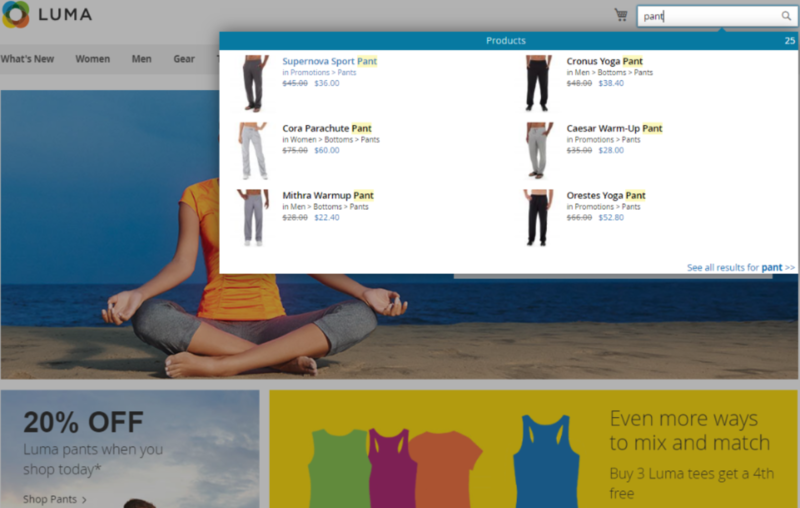 The popup includes results not only for products but also categories and CMS pages. Besides, you can add a block with “Did you mean?” search term suggestions. 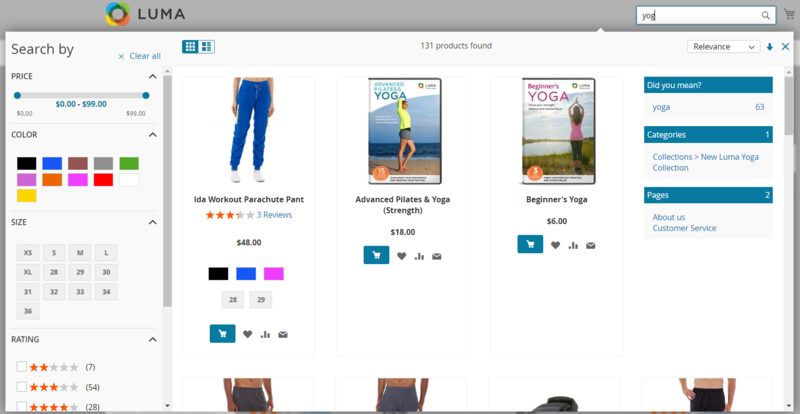 Thus, the Elastic Ecommerce complete suite lets your customers look for desired goods throughout various pages of your website. Note that the Magento 2 module supports configurable, bundle, and grouped products. As for the configuration of the autocomplete box, you can place the “See All Results” link at its bottom, as well as the “Add to Cart”, “Add to Wishlist”, “Add to Compare”, and “Email to a Friend” buttons next to each product result. The buttons significantly improve the shopping experience, as customers don’t have to leave the current page where they perform their search if they want to add some item to the cart. Also, it is possible to display the number of reviews and ratings of a product in the search popup, as well as allow products sorting by various parameters including rating. This way, you help your store visitors quickly decide which goods to buy. A maximum number of items displayed for products, categories, and CMS pages, as well as the search term suggestions, can be set from the backend. For making search results more relevant and accurate, the Elasticsearch complete suite allows adding layered navigation filters to the search algorithm. Admin users decide which product attributes to include in the navigation in the autocomplete window and category and search results pages. Configurable attributes like price, color, size, rating, and category can be leveraged for each product. Thus, you allow customers to filter search results by various attributes to quickly find the desired goods. The Magento 2 extension allows applying multiple values for the same filter, making the search even more precise. As for the appearance of the layered navigation filters, they can be placed in the top, left, or right position on the page. It is also possible to display the results count for each attribute, hide unavailable product values, and show price filter as a slider or input boxes. 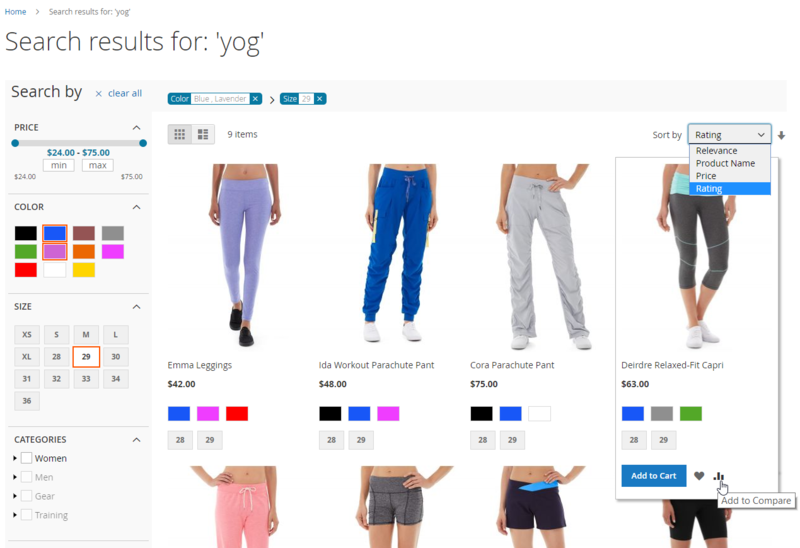 Another essential feature provided by the Elastic Ecommerce All-In-One suite is Ajax Cart on both categories and search result pages. This functionality allows avoiding page reloads when a storefront visitor adds some items to the shopping cart. As for other products listing settings, they provide sorting by relevance, product name, price, or rating and possibility to display product reviews and ratings. Also, you can place the “Add to Cart”, “Add to Wishlist”, and “Add to Compare” buttons next to the items in the category or search results page, as well as the “Back to Top” link. Moreover, breadcrumbs can be enabled to make the applied navigation filers visible at the top of the page. Other settings available with the Elasticsearch suite include Infinite Scroll in a category and search results page, with a configurable number of items loading at each scroll step. Besides, Magento admins can customize the labels for the “Clear all”, “Sort by”, and “End of list” links. It is also possible to enable highlighting of a search query word both in the autocomplete popup and search results page. From the admin perspective, the Elasticsearch module offers various settings for customizing the design of the autocomplete box and layout of the categories and search results pages. Besides, admin users can easily configure all necessary options with the extension’s intuitive backend interface.